November 10, 2014 – Don’t lose the story! Good morning! Hope you had a restful Sunday! We come from a traditions of passing stories on. I went to a conference last spring and one of the speakers described the Bible before it was written as when, “It came wrapped in skin and looked like breath.” Our stories are meant to be spoken. The scripture is meant to be read aloud and with real breath. It is mean to be passed down from generation to generation with inflection and heart. As humans, it is all important that we carry the stories, like our Psalm writer proclaims. When I come into whatever organization I have walked into, I usually look for what story is being told. I LOVE stories and I love telling them. Even more than telling them, I love listening to each unique one. 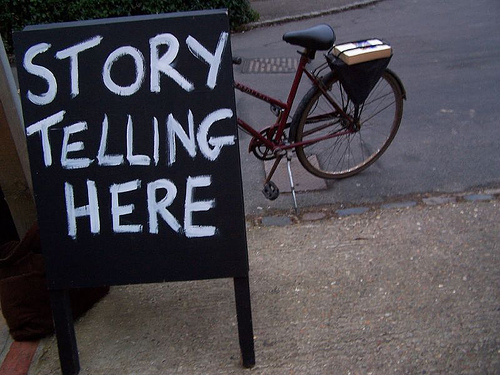 Stories convey where we come from and what we value. If a non profit or church or organization has lost its story, even if has changed over time, then it has lost its core. What story do we tell to keep us going? If an individual has lost their story, they have also lost where they are going and what they value. As I said, I love telling stories as much as listening to story. My ears are always perked for the next story so that it might be relevant to connect to God’s word when I preach it or tell it next. When a notice by email was announcing a workshop last week to enrich our storytelling, I immediately signed up. Anything to enhance storytelling is intriguing to me. My family has all gotten used to it. They all know that they are fair game for my sermons and the stories I tell might be slightly embellished for the greater good….a good story has some embellishment looped in. So I went to this workshop last week and it was probably one of the best things I have done for development in a long time. It was actually more of a 6 hour improv workshop than storytelling but it taught me some great lessons about the art of story. If you will indulge me…..
– We must tell the story that makes sense for the time and place. – Order needs just a bit of chaos to keep things working and interesting. – We have to build off of what has happened before us. – We must recognize that feelings are not just “fine” or “good” but carry layers to them and all at once. This is who we are interacting with and who we are. – Sometimes we have to open ourselves up to claim failure to be present here and now instead of hiding away in shame. – And most of the time, we need to open ourselves up to forget what we are afraid of looking like to be playful…it will make it so much better. That will preach, eh? You can interpret these for your own setting but most of all DON’T LOSE the STORY! That is what the Psalmist is calling for today. We have a responsibility to keep passing on the stories of who we are and who we belong too. There are so many stories out there of hell and God NOT loving….we have to tell the true story!! God is love! Here is a parable about it…an experience about it….a moment when God forgave me and loved me anyway….etc. I think you get the picture. Tell your story to someone today! Previous Post Daily devotional begins!